New Hampshire seems like the perfect set for filmmaking, and it has been featured in classic comedies like “What About Bob?” and dramatic TV shows like “The West Wing.” Problem is, most scenes that feature the Granite State are shot elsewhere — places where Hollywood knows they can recoup some of the money spent in the form of tax incentives. In tax-averse NH, that’s a problem. Ernest Thompson, still lives in the Lakes Region where he grew up and has never stopped writing and making movies — movies that Hollywood has happily produced elsewhere. He has made two feature films locally like the old Yankee he is by making do with what’s handy ­— local talent, volunteers and a little baling wire to tie it all together. He’s proud of them both, but his next project requires a bit more, because he thinks it’s too important to relegate it to the festival circuit. He says his new movie, “Parallel America,” could be just what our country needs in these contentious times, and he’s looking for financial help to ensure it’s made right and made here. A GoFundMe page (for $150,000) and social media campaign are helping stoke interest. Meanwhile, Thompson is happy to evangelize about why filmmaking in New Hampshire should be something we all get behind — and it’s not just about making the Granite State more famous. “We’re losing young people,” he says. 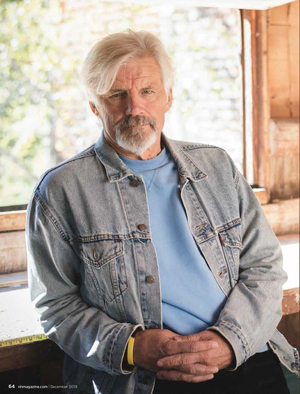 “They come of age here and there’s nothing to stay for.” Thompson says literally thousands of young creative types have passed through his projects and his “Write on Golden Pond” workshops. “They work and learn and go elsewhere,” he says. His other project in the works might tighten the focus. The sequel to “On Golden Pond,” titled “Home on Golden Pond,” is set be produced in the next year or so and it will be up to the State of NH to decide if it’s filmed here entirely, spending a $15 million budget locally, or if the crew will just fly in to capture some establishing shots and then film the rest on some other less-golden pond in some other state. He says there are legislators who get it and are trying to push for a tax rebate for major films made here, and there might even be a last-minute plot twist involving Gov. Chris Sununu. “He was a film student at NYU,” says Thompson. To read this article online at NH Magazine, click here.